I will do a different kind of implementation so my results will differ due to different data and different strategy. 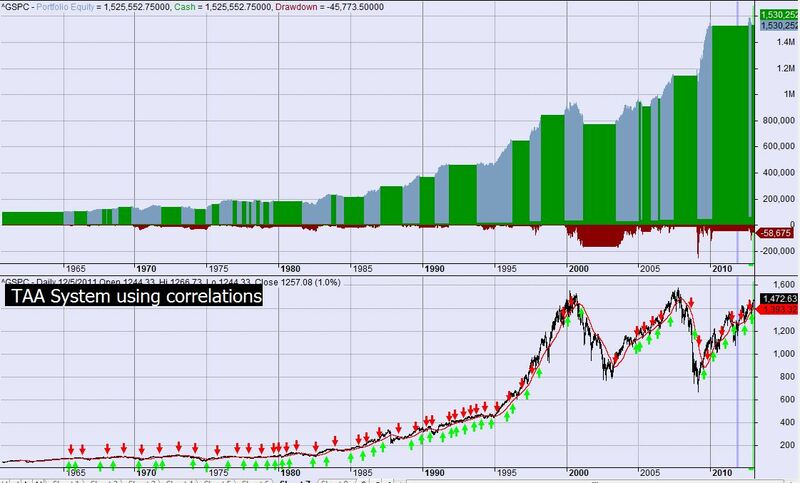 When referring to correlation I will be referring to the correlation of the SP500 to the inverse of the 10-year Treasury yield. The system will either be long the SP500 or be in cash. 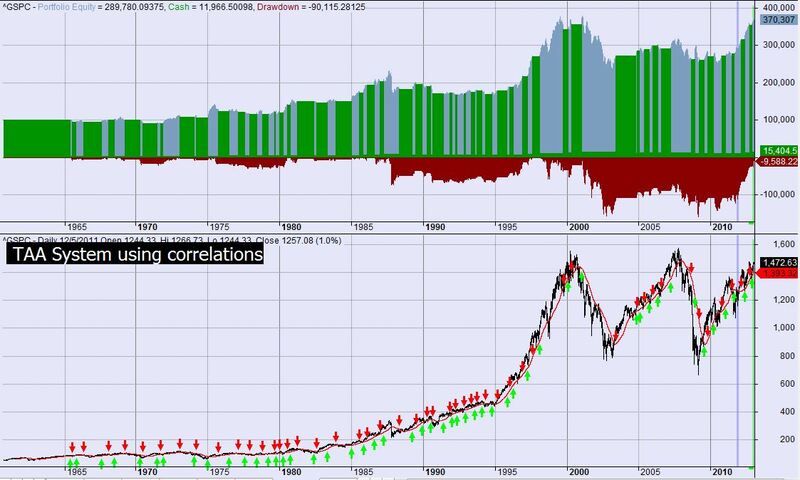 Each month it will look at the short and long term correlations and if stocks/bonds tend to be more correlated than usual, it buys the SP500. If not, it sells it and holds cash. I will be using yahoo free data: ^GSPC (S&P500 Index) data as the “risk” asset and (1/ ^TNX, the reverse of the 10-year Treasury Yield) to represent long-bonds. We ‘ll keep 2 parameters optimizable and lock the long moving average period to 600, to keep things simple. 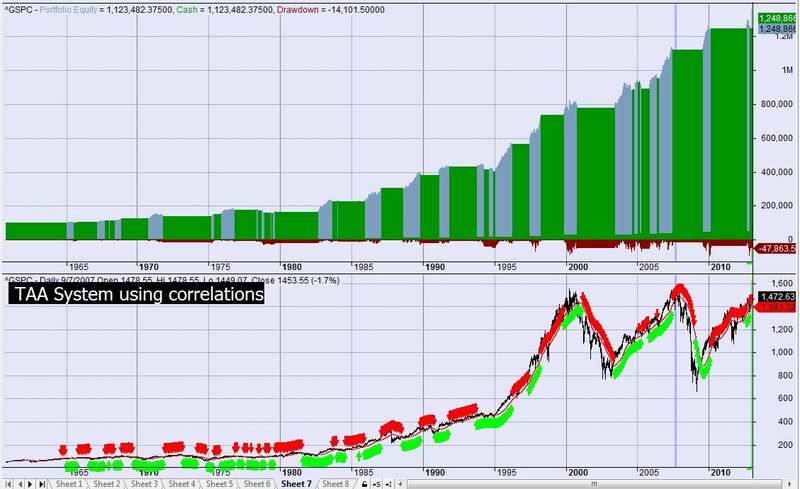 Just for fun let’s do the exact opposite: We will buy when the short term correlation is less than the long term one. Same parameters. 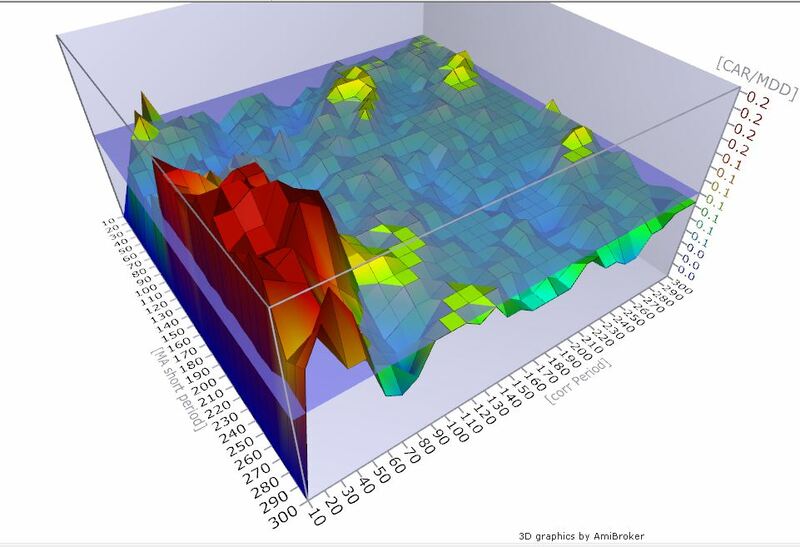 Let us optimize the parameters to get a better sense of what is happening. Is there a “general acceptable area”? There seems to be a “better” area of settings than the one we are using. Let’s try the backtest with params [40 220]. 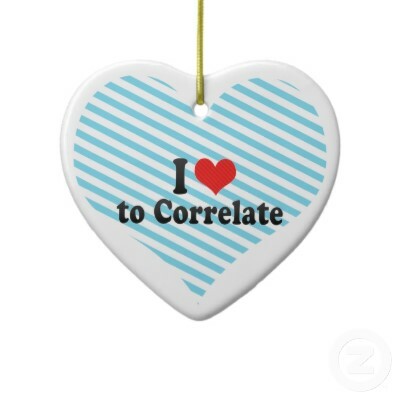 In other words we are calculating correlation using a 2-month window. We are then comparing the almost yearly moving average of that to the 600-day longer term one. Using these optimized parameters, what would trading the 5 core etfs would look like? Risk on means buy SPY,EEM,EFA and VNQ. Risk off means buy IEF. The equity is for the whole 5 -asset system. 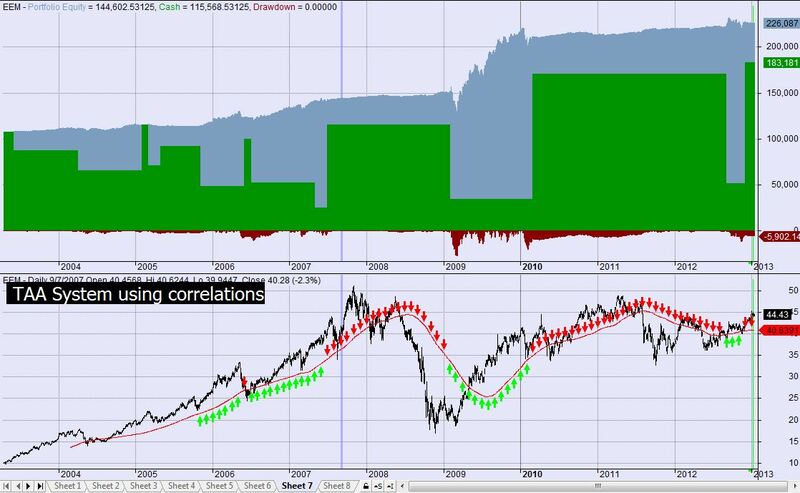 The lower pane shows the Emerging Markets time series (NYSEARCA:EEM). You can see from the lower graph, this system did not buy EEM for the whole 2010-2013 period. Disclaimer: This is a quick and dirty try-out of whether stock/bond correlation can help differentiate bull/bear regimes. 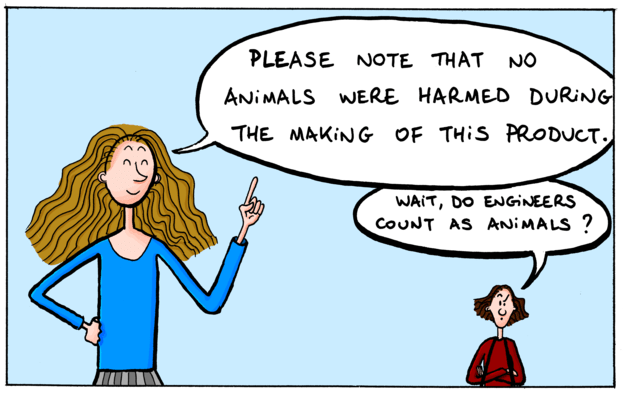 It’s not meant to be precise but rather to get you started in performing your own tests. I will caution the reader that when it comes to “TAA” strategies, for the past few years, holding both the S&P500 (SPY) and bonds (IEF) was an exceptional strategy whether you timed it or not. 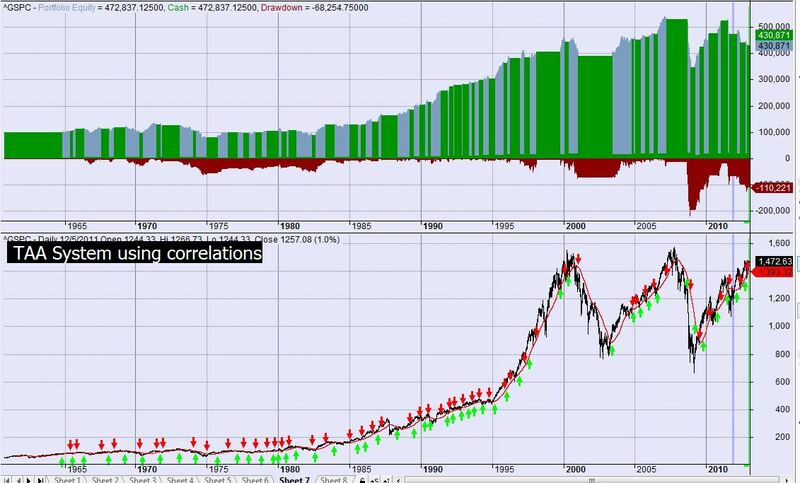 That is mostly due to the fact that IEF, the 10-year treasury proxy had both an exceptional run and a fairly uncorrelated one to the stock index. As others have mentioned, TAA systems may have a hard time delivering if Treasury yields stop dropping (below zero..?). But one way to look at the typical TAA strategy is that it is a diversified “short-the-dollar” strategy. Looking at it that way, there is room to diversify to non -U.S. denominates assets. Very interesting. So is it correct to say..
4. If answer at step 2>answer step 3 go long? 5. If answer at step 2<answer step 3 go short? I didn't quite follow this. Hi Sanz, Congrats for your blog, its very interesting.